Brewing beer is one of Northeastern Pennsylvania’s longest standing pastimes. Today, there are 27 breweries, both big and small, operating in Northeastern Pennsylvania. To celebrate, we’ve put together the DiscoverNEPA Brewer’s Loop, which spreads out over 390 miles of remarkable NEPA scenery. The Loop itself traverses 9 counties and stops in 24 incredible towns. 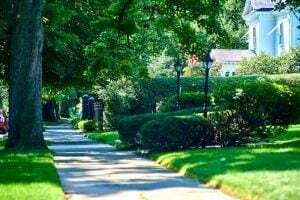 It leads you along tree-lined highways, stunning stretches of rural road and into some truly fun cities. All told, the Loop is a trail of over 350 different beers. From delightfully bitter IPAs and deep, caramel stouts to crisp lagers and light, easy wheat beers, you’ll find each innovative brewer on the Loop contributes a distinct flavor and style to everything they offer. It may not be possible to complete the DiscoverNEPA Brewer’s Loop in a single day, but even if it was, we wouldn’t recommend it. This portion of the DiscoverNEPA Brewer’s Loop totals just over 98 scenic miles. It covers 3 counties, with stops in 9 unique towns, and it includes 9 breweries. Much of the route runs along the mighty Susquehanna River. Bloomsburg is becoming a beer town, and the Turkey Hill Brewing Co. is leading the charge. This charming brewery and pub welcomes visitors with exposed beams and stonework. The beers are the true standout here, but the comforting and delicious food gives them a good run for the money. The Berwick Brewing Co. is a true, old -school, classic hometown brewery – the only exception is the stunning variety of beer. With over 20 taps, it’s tough to settle on just one style. Stop by in the summer and enjoy their German-style biergarten overlooking the Susquehanna River. Belly up to their classic, horseshoe bar, grab a table overlooking the yard or find a seat on the porch. This small-town brewery runs 12 rotating taps featuring their freshest beers made with only local, homegrown ingredients. Surrounded by lush, green mountains, this Shickshinny favorite has become a go-to spot for fresh brewed, cold beer. The cozy taproom is the perfect size for a relaxing night out with friends. They also fill growlers. You can see all the magic happen from the comfort of your table at Benny Brewing Co. in Hanover Township. The pristine, wide open brewery and kitchen are on display as you sample any of the eleven beers on tap. FYI – they have a BBQ pit out back. 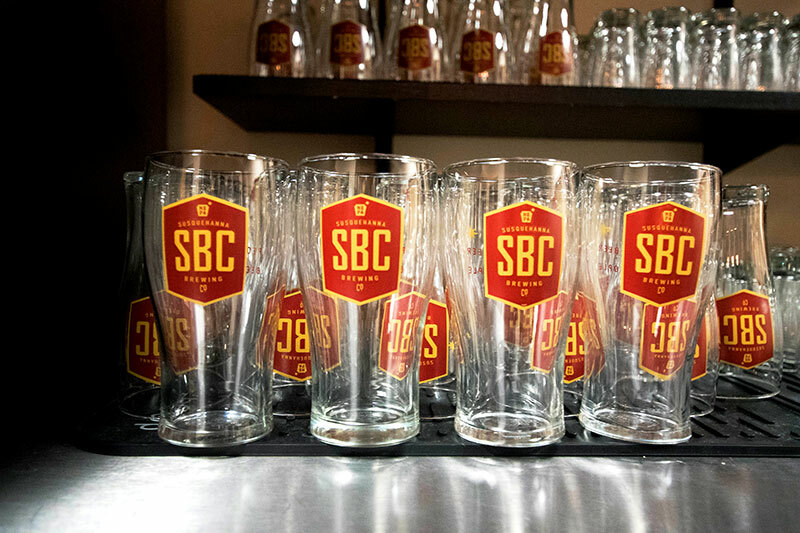 Housed in a former monastery in Wilkes-Barre Township, this popular brewery and brewpub offers an ambitious dining menu to pair with their 8 unique rotating drafts. It is also home to arguably the best hand-rolled, fresh baked soft pretzel in all of NEPA. 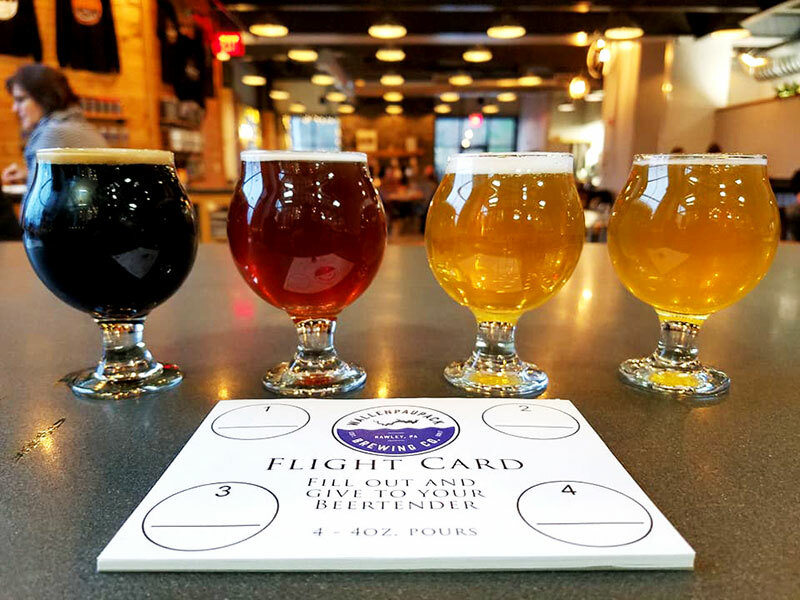 Noted for their incredibly laid back and informative brewery tours, this pioneer in NEPA craft brewing also features a tasting room with 8 of their fresh brewed beers on tap. And if you’re a true fan, you’d know that they also regularly tap casks of rare and experimental beers. Take in the beautiful mountain views from the deck at this popular Moosic brewery and restaurant. Pizza and beer are their specialty, and with 8 drafts always running, you’re guaranteed to find something that works. NEPA’s expansive northern countryside provides the tranquil setting for this winery, brewery and tasting room. They feature a regular line up of 7 year-round beers and the occasional seasonal offering. Exposed brick and rafters, live edge, wood plank tables and finished metal chairs offer a cozy industrial vibe for this Back Mountain favorite. It also helps that they always feature 11 tasty beers and an innovative modern menu. Named after the two beautiful regions it covers, this section is the longest at 184 miles. It will carry you from the pastoral countryside of the Endless Mountains to the dense forests of the Poconos. There are 10 breweries along this route as it spans 5 counties and ends at the picturesque Delaware River. Anchoring Historic Montrose’s Phoenix Block, this neighborhood micro-brewery always delivers with at least 10 fresh beers on tap. They also feature a light snack menu to keep you just thirsty enough to continue sampling the beer. With a cozy, little tap room, and eight reliably tasty beers on draft, this Montrose brewery is a favorite among locals. Sample a few of their experimental beers and take home your favorite in a growler. With a coveted corner locale in downtown Carbondale, this brewery and tap room typically features a 10-beer rotation. They also offer a limited menu with unique twists on old favorites and frequent live, local music. History courses through this landmark Honesdale brewery. It’s also evident in the brewery’s method of cask aging their hearty ales. The tap room and restaurant are also basically a celebration of everything great about beer. Offering a charming take on the neighborhood brewpub, this Main Street favorite delights with innovative beers, an ever-evolving menu and a reverence for classic rustic design. Sit down and pair a pint with a pizza, or grab a growler to go. This contemporary Pocono brewpub offers the perfect spot for gathering with a few friends, or for a night out with the family. With 12 beers on tap and a fresh, locally-sourced menu, good times aren’t hard to find. Situated directly between Scranton and Lake Wallenpaupack, this modest brewery keeps it simple with only tours and growler fills. What’s not so simple, however, is the beer. Try their local favorite Maggie’s Tail English Ale or look for their easy-breezy summer wheat beer. Call today to make an appointment for a visit and growler fill. It’s all about beer and great music at this little gem in the heart of the Poconos. Their often-whimsical beers and the funky tap room ambiance will leave you wishing the night would never end. Quaint, historic Milford offers an alluring setting for this popular brewery and taproom. Steel, stone and wood combine to create a rustic ambiance that fits the character and deep, bold flavors of their beers. This popular brewery nestled along the mighty Delaware River features a spacious tap room and an incredible pizza and pretzel menu. They offer live local music every weekend and the occasional open mic night. Also, the beers are ridiculously good. This section of the Loop reaches into NEPA’s southernmost counties. Extending 109 miles westward from the wilds of the Poconos toward the undulating valleys of southern hard coal country. It passes through 3 counties, stopping in 6 towns. You’ll hit 7 breweries along this route. There’s just as much emphasis on the delicious food as there is on the craft beers at this family run southern Pocono brewery and restaurant. Pair any one of their 8 beers with an oak-wood fired pizza. A Pocono favorite since the mid-90s, this brewery and restaurant has almost too much fun making great beer and food. There is also a spacious Beer Garden and mini wiffle ball stadium. The stunning mountaintop setting and the incredible views are enough to warrant a trip to this Stroudsburg winery and brewery. It just happens to be a bonus that they also make delicious beer and wine. At this blue-collar brewery and tasting room, every beer is pulled directly from the serving tank. And every sip embodies the rough and tumble spirit of Tamaqua. You’ll always find innovative, fresh cold beers on tap at their comfy tasting room. This neighborhood nano-brewery in Tamaqua’s Historic District celebrates the region’s hard coal heritage one beer at a time. The brewpub features an authentic Oktoberfest vibe, including real tables imported from the famous German festival. It’s just simple, blue-collar beer at its best. If you’ve been around for nearly 200 years, you must be doing something right. This brewery has remained the beating heart of Pottsville since 1829. They were then and still are considered the king of American lager. There’s no better place to lose yourself in the brewing history of NEPA. There are always 13 fresh beers on tap at this popular Bloomsburg hotspot. But don’t worry, there’s more than enough delicious food on the menu to pair with your IPAs and Porters. DiscoverNEPA Brewer’s Loop is an homage to Northeastern Pennsylvania’s proud history of brewing. You don’t have to be a devout student of craft beer to enjoy yourself along the Loop. The brewers and those who show up to enjoy their toils are down-to-earth, beer-loving people. And, in the end, that’s all you really need.